You are traveling to Cambodia! Great decision! Cambodia is a beautiful country, just regaining its strength after going through a very rough time. Tourism is very important for country’s speedier development so every visitor counts. With the beauty and historical wonders Cambodia offers, no wonder tourism is actually on the rise. If you have more or less 2 weeks in Cambodia this Cambodia itinerary will be perfect for you. Not only we have included a day by day schedule but also the best places to stay in Cambodia and some great tips and tricks to make your Cambodia trip unforgettable. 2.2 What is the Best Time to Visit Cambodia? Everyone visiting Cambodia has to obtain a visa, except the citizens of ASEAN (South East Asian Nations), who have up to 30 days visa exemption. Visa can be obtained at any land border entry point or at the airport. Cost of the Cambodian visa is $30 and not a dollar more. It is very common for police and immigration officials to try to scam you and add extra fees, but NEVER pay anything more than $30. You can also opt to obtain an e-visa, online, before your arrival. E-visa costs $36. Good to know: All Cambodian visas are extendable for up to 1 year and it is quite a straightforward process. The most common time to visit Cambodia is from November to February, which is the cool season. The weather stays pleasant and warm. The hot season is deemed to be March to May when most likely you will bake while visiting Angkor Wat temples, it is an awesome experience anyhow. The rainy season is considered to last from June to October when it rains a bit during the afternoon and the country comes alive in lush greenery. Honestly, any time you plan to visit Cambodia will be great and the differences between the seasons cannot be felt that much. We have been around Cambodia throughout all the seasons and none of them raised doubt of not visiting or not sticking around. Tip: Your adventurous 2 weeks in Cambodia should be spent exploring and having fun rather than worrying about a bit of heat or rain here and there! There are no specific vaccines you should get before traveling to Cambodia. Make sure you are up to date with the routine vaccines like diphtheria, chickenpox, and polio. We are not even sure if we have had the vaccines for the above mentioned. Typhoid probably is the most common illness a traveler could get so be sure to have a shot for the nasty belly virus. There is a slight possibility of malaria and its even nastier brother dengue fever in Cambodia, especially around the rural areas and islands, so always sleep with a mosquito net over your bed and use mosquito repellant at all times. Everywhere in Cambodia, and we mean EVERYWHERE, the US Dollar is accepted. All the prices are in US Dollars, ATM’s spit out US Dollars and even street vendors use US Dollars. However, Cambodia’s national currency is Riel, which comes in many small banknotes that will make you feel like a millionaire if you get your hands on them. 4 Cambodian Riel equal $1 and often when paying in US Dollars you will get the change in Riel so always calculate the amount you receive back. Cambodian Riel is useless outside of Cambodia so make sure you get rid of all the change you have left before exiting the country. ATMs are available everywhere around Cambodia, and if it was not the case a couple of years ago they now even have ATM’s on the islands such as Koh Rong. The maximum you can withdraw is usually $600 for most ATM’s. If you withdraw $500 you will have to pay a commission of $5, however, if you withdraw $600 you will have to pay commission fee of $9. Arriving in Siem Reap after a long day is best rewarded by getting ready for the new adventures and getting to know the city a little bit. If you arrive in the afternoon and are eager to see Angkor Wat the next day, make sure to make it to the Angkor Wat ticket office before 5 pm and purchase your ticket for the next day. One day ticket to Angkor Wat costs $37. Two-day ticket costs $62. A three-day ticket costs $72. If you purchase a ticket for the next day after 5 pm you can enter the Angkor Wat territory without a ticket to see the sunset. It is a great warm-up for the next day of exploration and a beautiful welcome sunset to Cambodia. However, if you arrive late and cannot make it to the ticketing office just rest and head to the ticket office next day at 5 pm. If you did not make it to buy the tickets for Angkor Wat the day before you will have the first part of the day free to explore around Siem Reap. There are many other things to do in Siem Reap apart from Angkor Wat. One of the must-visit places is the Landmine Museum. If you are not much of a Museum person and prefer getting your dose of adrenaline go ziplining with Flight of the Gibbon. After some morning activities go and indulge in a cheap $4 massage and explore the Siem Reap street food variety. Before 5 pm following the instructions of Day 1 buy your ticket for Angkor Wat. 1 full day from sunrise to sunset (it is going to be tough) is enough for Angkor Wat if you are on a tight schedule. 2 or 3 days would be recommended to see all the beauty with no rush. If you have more time and do not want to spend 14 hours temple hopping you should, of course, choose to take the two-day or three-day ticket. Arrange a tuk-tuk that will take you around Angkor Wat and decide on meeting him at the front of your hotel at 4:30 am. A full day tuk-tuk service should not cost more than $17 in total. Prepare some snacks, lunch, and water the night before. Go and explore the Angkor Night Market and make sure to go to bed early as tomorrow is going to be a looooong day! Wake up bright an early and get ready for an amazing day! There are many gorgeous temples to see around Angkor Wat the guide deserves a separate blog post. Start your day at the Angkor Wat main temple. You have bought your ticket the day before so you will be one of the first people to arrive. Be sure it will get extremely crowded around sunrise time, so make sure you have a great spot. Another one of our favorite temples is Ta Prohm, where the movie Tomb Rider was shot. It is a very mystical and magical temple. Bayon is another gorgeous temple, it is also very popular among tourists. Actually, here is a great Angkor Wat guide to avoid the crowds and enjoy the magical place! After a long day, make sure to indulge in a great traditional Khmer meal and head to the Pub Street for some well-deserved $0.50 beers. Talking about crowds… Angkor Wat at sunrise. Take the morning bus to Battambang. You can arrange the tickets night before via your hotel or any of the agencies on the streets. The cost of the ticket should not be more than $6. The trip takes roughly 4 hours, Asia time (so nothing really ever is on time). The bus leaves at 8:30 am. You will be picked up at your hotel at 8 am and taken to the gas station, which also serves as the bus station. In Battambang, you will be greeted by many tuk-tuk drivers who “work” for hotels as shuttle service. Once you see the name of your hotel, do not be scared to approach the tuk-tuk driver. He makes money by offering you 1 day and half-day tours (5 hours) around Battambang. You have enough time to do a half-day tour which should not cost more than $15 total. It will include approximately 3 sights of your choosing. Trust tuk-tuk driver’s recommendations and let him take you around. In Battambang, you can take a ride on the bamboo train. It is an old railway and the way it operates is quite unique. We were surprised that each of us had to pay $5 to take the ride on the bamboo train. It seemed that the money was taken by the big, shady, corporate guy who fills his pockets with tourist money to drive that S Class Mercedes parked in front of the train. Locals, living around the bamboo train and working on it did not seem to be that well off. We would not do it again. It made us quite sad. Battambang is famous for its bat caves that should not be missed. Around 5 million bats fly out of the cave for around 1 hour every evening to go hunting. Next to the bat cave is the killing cave where during Khmer Rouge regime many Khmers were taken, lined up, hit with a wooden stick and dumped in the cave. On top of the same hill is a beautiful viewpoint and if your tuk-tuk driver is knowledgeable enough he will take you behind the hill to see the sunset. All of this while thousands of bats circle around you drawing amazing figures in the sky. There are two ways how to get to Phnom Penh. You can take the 7 am morning bus for $7 which takes approximately 6 hours to reach Phnom Penh. You can also choose to spend another full day in Battambang and arrange some other tours and take the night bus for $15, which leaves around 10 pm and reaches Phnom Penh the next morning. The good thing about the night bus is that you save one-night accommodation costs. You also get to travel in a sleeper bus so you do not waste your daytime. However, the bad aspect is that night buses in Cambodia are deemed to be dangerous as drivers tend to fall asleep and drive off the road. Guys, we had to tell you, right? We chose the day bus just because there was an accident like this a couple of weeks before we arrived. It does not happen often and we have traveled through Vietnam only on night buses (apparently in Vietnam they are even more notorious). It just really depends on how much time you have and what you prefer. If you arrive in the afternoon, the first thing to do is get to explore the lively Pub Street (yes, another one) and go for dinner at the night market. Hang out by the riverside and relax from the bus trip. If you arrive the next morning you can follow the guidelines of Day 6. Wake up early and go visit the Royal Palace. It is well worth the $10 entrance fee and reminded us of the Royal Palace in Bangkok. After that, go visit Killing Fields and S-21 Prison. Those are two very emotional places to visit and, to be honest, we had a hard time. Well, Linda(me) is also a very emotional person. Definitely take the audioguide which costs only $3 extra the $3 entrance fee. The audioguide is pure facts and will leave you trembling after the realization of the terrible recent Khmer history. Tuk-tuk can take you to both places on the second part of the day for around $15 total and you will be back by 5 pm. To conclude a great day of exploration, you have to go to this amazing seafood place. There is no specific name that will distinguish the place but follow this location in Google Maps. The place is located right on the corner of the intersection. They serve all kinds of seafood for $3 a plate. For example, 20 oysters for $3. Unbelievably fresh. The place is very popular amongst locals and it is always packed from the moment it opens. After spending some decent time in the seafood paradise head back to the pub street for another $0.50 beer and arrange your bus for the next day’s trip to Sihanoukville. Bus cost between $7 – $10 and if you prefer you can opt for a little bit faster mini-bus service. Usually, it takes around 6 hours to reach Sihanoukville. After arriving in Sihanoukville you will be greeted by Chinese infested casinos and quite a gray town. Fret not, just head to the beach. Tuk-tuk from the bus station will cost you a maximum of $5. Do not listen to the touts trying to grab you right out of the bus. Go some 200 meters further and arrange a decent tuk-tuk for a decent price. Stay 1 night at Otres beach. By far it is our favorite beach in Sihanoukville. It is clean, quiet and with many beachside restaurants around. Arrange a pickup and a ferry roundtrip to Koh Rong at your accommodation. It will cost $22 for a roundtrip, including pickup at the time you decide. Jump on the speedboat and head over to Koh Rong island. Its crystal clear waters and sandy beaches will leave you in awe. After checking in your hotel explore the Koh Toch beach. We recommend staying central so staying at Koh Toch beach. There are other beaches, such as long beach and lonely beach, but they are very quiet. Also, they are meant for people, who love to stay at secluded resorts and seek peace and tranquility. If you want to have some time to yourself, head to one of the quiet beaches and stay there, otherwise, stay at the very center of the action – Koh Toch. There are many bars and restaurants along the shore so take your time to explore the area and get some tan. Acknowledge: There are power outages almost every evening for a while. It can be anything from 2 minutes to 2 hours. Also, the accommodations are quite basic, so not many places offer air-conditioning and hot shower. Hostel walls are paper thin. If you want some comfort and privacy, it might cost a bit more than you are used to in Cambodia. Wake up bright and early and take a day trip to Koh Rong Samloem. It is a beautiful neighboring island and a ticket for the taxi boat costs $5 one way. Koh Rong’s little brother Koh Rong Samloem is very quiet, laid back and relaxing. This is the perfect day escape to enjoy the nature and explore the less visited island. In the evening head for one of the $5 BBQ + 1 Free Beer offers and eat like a king. Be sure to come early as the tables fill up fast and often they run out of either fish or pork chop or other meat options. Another beautiful morning in paradise. Spend your last full day in Koh Rong by visiting the Long Beach. And, who would we be if we would not tell you about the most adventurous way to get there. You have to hike through the jungle for about 1 hour to reach the beach. You will have to hike all across the island so walking through fresh water spring and climb some rocks. In the end, you will be rewarded with a beautiful beach view. Ask locals for the place where to start the hike to the Long Beach and they will point you in the right direction. After the sunset, you won’t be able to hike back through the jungle so just take the taxi boat back to Koh Rong for $4. Of course, if you want to take it easy there is a boat running to the Long Beach at around 12 noon and coming back at 6 pm, roundtrip costs 8$. The Long Beach is quite nice, white sand beach. However, many big hotels have started building their resorts there, so the public beaches are quite polluted, while the private ones are sparkling clean. Just walk along the shore and sit down at one of the cleanest parts of the beach. As long as no one is telling you to leave, because, it is for guests only, you will be alright. We always do that and most of the time the staff will just think you are a guest of the resort. Important: Upon returning home go to the ferry pier and arrange your return boat ride for the next day. The office is open until 7 pm. Take the ferry back to Sihanoukville as early as possible and at the ferry port, you will see many offices offering transport all across Cambodia. Inquire about the next bus to Kampot. The bus usually runs at 9 am and 3:30 pm. It takes roughly 2 hours and costs $8. The main attraction in Kampot is the river and all the activities you can partake. One of the most popular ones is the Firefly Cruise on the River. You will see a beautiful sunset on the river and upon coming back thousands of fireflies will light your way. Note: Often due to heavy rains or full moon you will not see the fireflies. However, the cruise is still worth taking. Rent a motorbike or hire a tuk-tuk to visit Bokor National Park. It is a stunning way up the mountain and worth a thousand stops and pictures. The famous old casino that everyone seemed to visit on the way is now rebuilt and does not hold its mystical charm anymore, however, there are many other spectacular sights on the way. Popokvil Waterfall is a must see if you are visiting in the rainy season. Do not be put off the fact that it is 5km away from the old/new casino. Jump on your motorbike and go explore. Visit Kampot Pepper Farm. Did you know that Kampot is famous for its peppers worldwide? Perhaps you have been using them in the US or Europe without even knowing where they come from. Well, now you have the change to see, touch and taste the famous peppers. Take a day trip to Kep by either public transport or rent a motorbike. We would recommend renting a motorbike, as the police are not as active as in Siem Reap and it is the cheapest and most convenient way to get around. Motorbike for a day will cost you $6. Hiring a tuk-tuk for a day is also a convenient option, as the distance between Kampot and Kep is only roughly 45minutes. A tuk-tuk for a day would cost $15 total. He will take you to Kep, wait around for you while you explore the little city and then take you back. Kep is famous for the best crab dish in the whole of Cambodia cooked in a very unique way. Perhaps it is best in the world. You should not miss it. Go try it out at the Kep Crab Market. You will also be able to see how the crabs are brought out of the sea and cooked right in front of you. Either you are flying out of Siem Reap or Phnom Penh you have to get there. If you fly out from Phnom Penh get a bus from Kampot (Giant Ibis Bus), which takes roughly 2 hours 30 minutes and costs $9. However, you are flying out from Siem Reap we would suggest getting a night bus to Siem Reap the day before or a flight from Sihanoukville or Phnom Penh to Siem Reap respectively. If your flight leaves later in the day, you will still have time to do some shopping in Phnom Penh before heading to the airport. It takes around 40 minutes to get to the airport and we strongly recommend booking your ride via Grab App (the same as Uber in The US and Europe). You will get $5 off your first ride if you sign up via the link I provided, so you might even get your ride to the airport for free! Otherwise will cost around $5 and by using Grab App you do not have to complicate your life by haggling with taxi drivers. The cheapest way to get around Cambodia is by bus. Giant Ibis is the most popular company amongst tourists and is reliable with a good safety record. You can even book tickets online in advance. Do not use the public local buses that have a very “local feel”, because they tend to never be on time and might be quite unsafe. Flights are available but tend to be expensive, except for rare promo deals flying from Phnom Penh to Sihanoukville or Siem Reap. Riding a motorbike is illegal in Cambodia if you do not have a Khmer license, however, unfortunately, you can always pay the police off. However, it is quite a hassle because the police have a keen eye for tourists and they will stop you considerably often. Thus, we would not recommend driving a scooter as the situation is not as easy going when it comes to foreigners driving as around the rest of South East Asia. If you have more than 2 weeks in Cambodia you can visit some other places such as Tonle Sap and Mondulkiri. You can also spend more time on Koh Rong island. The vibe there is amazingly relaxing. Also, an extra day or two around Siem Reap would come in handy if you would love to explore more of Angkor Wat. 3 weeks might be a bit too much for some speedy travelers but for some 3 weeks in Cambodia would be absolutely perfect. The official language of Cambodia is Khmer. The writing is very unique and something Latin alphabet users cannot read. It is similar to Thai but at the same time completely different. Most of the time there will be an English translation for whatever you need. However, surprisingly most Khmers speak some English and in top tourist places, they speak very good English. It was quite a surprise, for example, compared to Vietnam. It is very easy to ask basic directions to nearly anyone and most people are always happy to help. This time travel insurance is a big one. To be honest, not always we get a travel insurance, but if we had to recommend one place in South East Asia to have it – it is Cambodia. Road accidents happen, as well as there is a fair chance of getting a food poisoning or at least a very upset belly. Also, another threat is theft, which is quite common in Phnom Penh (unlike other SEA countries) so make sure to have a good travel insurance that covers all the possible accidents. 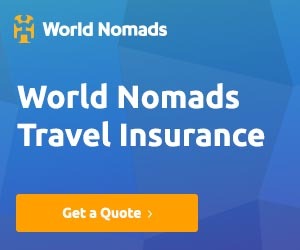 We always stand by World Nomads and highly recommend their insurance services. Amen to those guys!